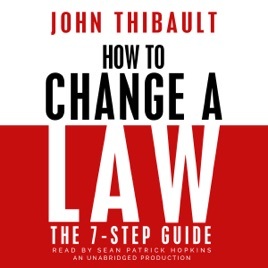 How to Change a Law is a simple do-it-yourself manual for voters and policy advocates who want to take political action and change laws. Using the iLobby platform and our seven-step guide, you will learn how to craft your message, build a coalition, and move your issue forward. You will also learn to vote on issues, not just for candidates. Most of us confuse politics with policy. In this book, we're not talking about getting people elected to office. We are talking about helping our elected leaders find solutions to problems that affect all of us. Issues like student debt, gun violence, immigration, cyber security, privacy, ISIS, energy independence, healthcare, taxes, etc. If you are willing to go on the journey, this book will be your roadmap to becoming a citizen legislator.